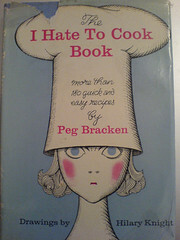 Was idly flipping through “beginner’s cookery” (Betty Falk, revised Penguin edition ’73, original ’64 – can any people tell me the appropriate citation when a publication has repeat editions? I should know this…), after a rough day at work and feeling like something simple… when I found… chocolate mousse! mousse?! no-one can make mousse at home! what is this doing in ‘beginner’s cookery’! How ridiculous! Yes, that’s what I thought too – but there’s only two essential ingredients and one optional one – and the optional one is BOOZE? And I do happen to have a bar of 70% Green and Blacks in the cupboard… how hard can it be! TOFFEE CRISP CHICKS (from ‘Novelty Cakes’, one of those Sainsburys related books they put out in the early 80s I think – photo will come). “This recipe was taken from Practical Cookery For All, published in 1953 by Odhams Press Ltd. It’s an all-round cookery bible with chapters introducing new cooks to a range of ingredients and techniques, modern kitchenware and the new science of ‘nutrition’. There’s loads of emphasis on presentation. Full-page colour photos depict dishes like meat ragout or mock roast served on giant silver platters, decorated with vegetable crowns, surrounded by oceans of peas and finished with delicate sculptures of piped mashed potato. The recipe chapters dive straight in with a selection of rich hors d’œuvre for the Serious Business of impressing party guests. Baked for the Vintage Cookbook Trials Canapé Party by Cis NS. “I realised in the run-up to the canape party that while I had a lot of “vintage” cookbooks, the majority of them were by writers like Elizabeth David and Edouard de Pomiane and somehow… not quite right. 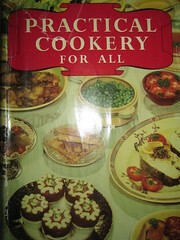 Luckily I was saved by the discovery of my mother’s copy of Nina Nicolaieff and Nancy Phelan’s 1981 Russian Cookbook, which promises that “all the romance and variety of th[is] vast country is contained in [Russian] cooking – a fusion of the exotic tastes of the East and the more familiar flavours of the West”. And so it is with this recipe! 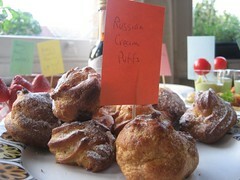 — okay, okay, actually these are pretty straightforward choux-and-crème-pâtissière cream puffs, nothing in the least exotic about them. But the name’s in Russian and that’s got to count for something. a) apologies for the delay; b) ph34r the fusion of herbed carot salad, mashed potato, sook choo na mool and SAUSAGES! This is what happens when you cannot make salads for one, have urgent leftovers in need of eating and yet CANNOT refuse yourself sausage and mash after a tough day. Hurrah? !